- Sari Colt on 七月 19, 2016. Toronto has a new place to experience the best of Holland. Michael Van Den Winkel and Jennifer Gittins, the owners of Little Sister and Bar Batavia, have renovated their old Quince space and turned it into Noorden Food Bar. Jennifer explained that Noorden is a modern Dutch 2 year “pop-up” restaurant and is a place where they can take chances in design and in food. The walls are painted in a graphic of the Amsterdam skyline. Gin is the preferred drink on the menu and Noorden has Toronto’s largest selection of gins available. There is a daily Happy Jam from 4-6pm with drink specials. The Dutch / Indonesian rijsttafel is available at Noorden with one week’s notice. Rijsttafel (rice table) is a meal that the Dutch adapted from the traditional Indonesian feast, Nasi Padang. It’s made up of many small dishes served family style all accompanied by rice. Noorden will even prepare it for as few as eight people. At the media “Happy Jam,” we had the chance to sample several delicious Dutch dishes from the “We The Noorden” menu, prepared by Chef Peter Tompkins. Patat Oorlog aka War Fries (with mayo and peanut sauce) were really good; we had to try two servings of them. Bitterballen, (one of Holland’s favourite snacks) is made here with chicken, which is deep fried and dipped into Dijon mustard. White asparagus came with sauce gribiche (mayonnaise style cold egg sauce). Chicken liver toast came with pickled onion and chimichurri. Pork ribs were with sambal cober sauce and cucumber salad. Crispy deviled egg was with house cured sardine. Beef tartar on krupuk came with pickled Asian pear and crispy shallot. Bay scallop tostada had grilled corn salsa and avocado. Roasted Cornish hen had grilled green onion and red pepper chili sauce. For dessert, we got to try fried sweet Dutch pastry. All of the dishes were really tasty. Drinks included a choice of two gin based drinks: “The KLM 692” with Toronto Distillery Co J.R.’s dry organic gin, Fernet Branca, Aperol, shrub and grapefruit bitters. The other was “The Angry Dutchman” with Bols Genever, green chartreuse, St Germain elderflower liqueur, fresh pressed lime juice, chili water, simple syrup, and ground toasted coriander. Noorden makes its own tonic water which goes well with the gins that they serve for the ultimate G&T. We toured the downstairs space and it is perfect for private dinners and functions. 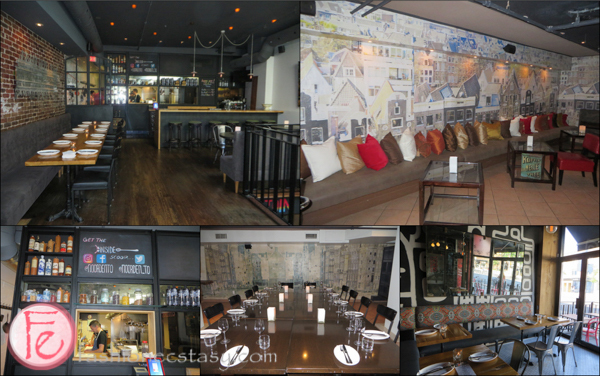 The decor is cozy with comfy couches, a large dining table which can seat many and a private bar. Noorden restaurant pop-up (located at 2110 Yonge Street, Toronto) is open daily from 4:00 pm to 9:30 pm and is a great place to drop in for a bite of Dutch treats and a glass of gin.